Believe it or not, there are countless ways that Bingo can be played. 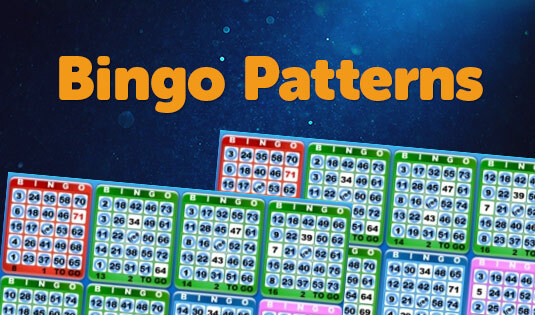 While everyone is familiar with the traditional way of getting a bingo; all of the numbers in a straight line, across, down, the four corners or a blackout, there are other bingo patterns as well. Sure, you have seen many different bingo games on BingoMania, but obviously, they weren’t a “thing” before. Bingo patterns can range from simple to complex. The key to understanding how a pattern works is to concentrate on the game in front of you. The pattern that is needed to win can manifest in all sorts of directions and provide a challenge for even the most seasoned bingo players. Different games require different patterns. 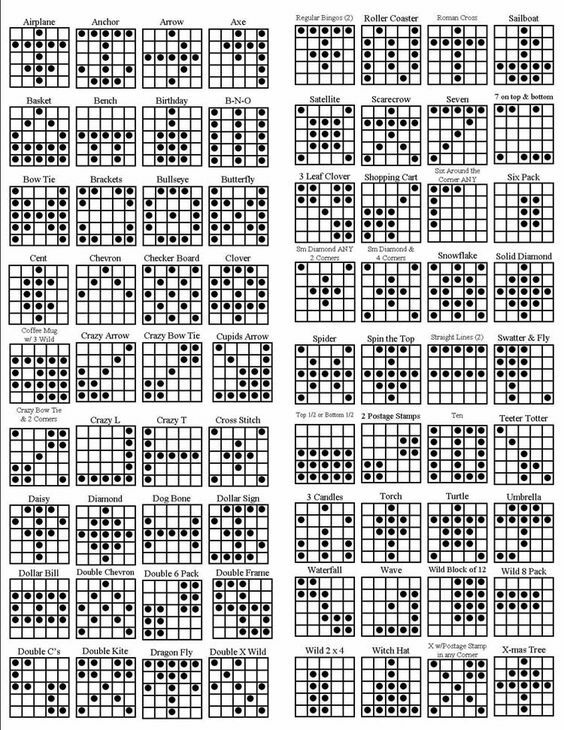 Here are some of the more common bingo patterns that are played around the world wherever bingo is played. Arro w – The arrow pattern can usually be formed in any corner and a diagonal that stretches to the opposite corner. B & O –For this bingo pattern, to win, every square in the B and O line are covered. Blood, Sweat & Tears – This bingo pattern is comprised of three bingos on the same card. For most games employing this pattern, having the four corners doesn’t count. Diamond – The diamond pattern in bingo is formed in the shape of a diamond with the square of each side of the bingo card forming the point of the diamond. Frame – The frame for this pattern can be on the outside or the inside of the bingo card. The winning pattern for a Dotted Picture Frame is made when every other square is used to make the frame on the bingo card. Holiday Themed Patterns – Some bingo game patterns are made to form certain themes that correspond to the holiday. For Halloween, a Jack-O-Lantern could be chosen. For the Christmas Season, it’s not unusual for the bingo caller to decide upon a bingo pattern resembling a Christmas tree, a holiday bell, a Santa hat, candy cane, or Christmas stocking. To ring in the New Year, it isn’t unusual to see a call for a bingo pattern in the shape of a champagne glass. Layer Cake – In this pattern is formed by the covering of every square in every other horizontal line. Letters – Your bingo caller may decide on a specific letter for a winning bingo. Letters are usually formed on the outside edges, diagonals, and corners on the bingo card. Popular letter patterns include the X, Z, S, or E.
Lucky Seven – One of the more popular bingo patterns is the Lucky Seven. A player can get this particular pattern with all of the squares in the top or bottom of their card and a diagonal line from one of the corners. Numbers – Like letters of the alphabet, the bingo caller will let players know the pattern before the game starts. The most popular number pattern is the number 7. Others include the number 3, 4, 8 & 9. The winner is the first person to form the number on their card. Pyramid – The Pyramid bingo pattern is a graduated stack from a filled bottom or top line, extending to a single point at the top. A similar pattern would be that of the Triangle. From any corner, the triangle of covered squares is formed to cover half of the card. Six Pack – A six-pack game means that a player has a pattern of six numbers, two rows of three each. These can be horizontal or vertical. This game may or may not allow the use of the free space as part of a winning pattern. Top & Bottom – This pattern is created when a player plays all top and bottom squares on their bingo card. Bingo is a versatile game that can make use of any number of patterns. Be sure to check the requirements before each game and try your hand at bingo patterns for your next online bingo game at BingoMania.